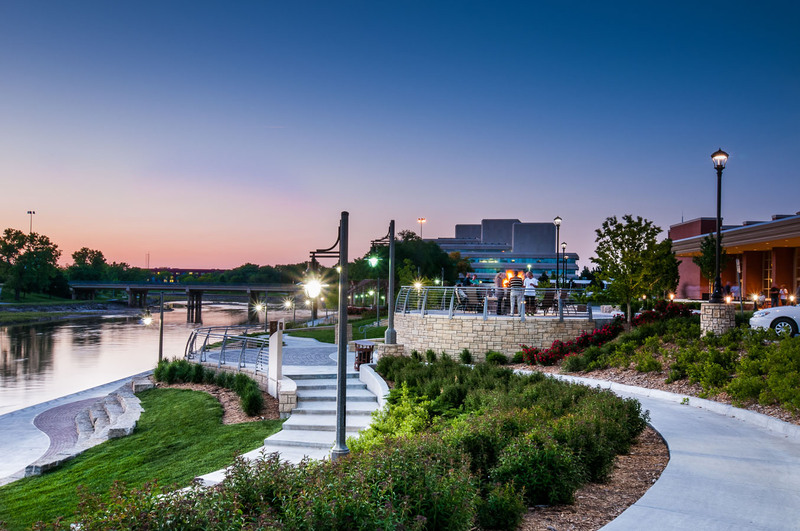 LK Architecture was commissioned by both the City of Wichita and Drury-Southwest Hotels to redesign the east bank of the Arkansas River from Second Street to Douglas Avenue. Previously masterplanned as a limited renovation, the project was expanded when Drury Hotels purchased the historic Broadview Hotel and embarked on a multi-million dollar renovation project. The final design concept integrates both the public and private portions of the project into a single, cohesive space with implied definition between use areas. 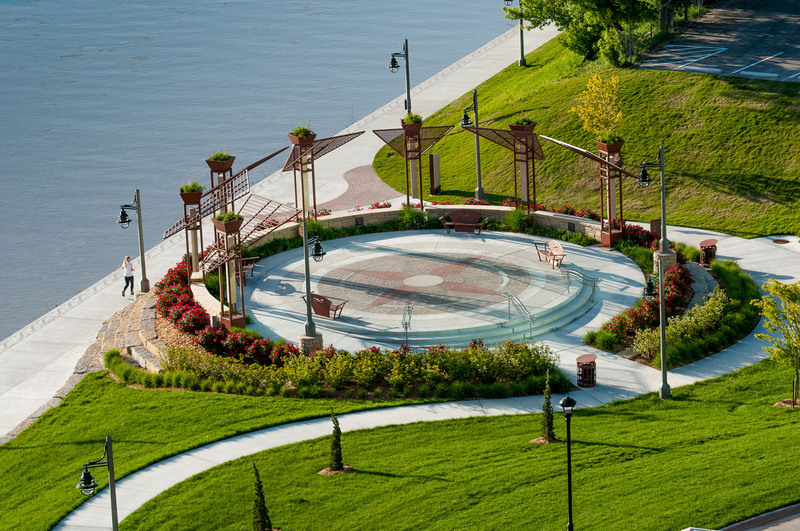 Drawing upon the established character of previous river front projects, this area emerged as a testament to private/public partnerships. 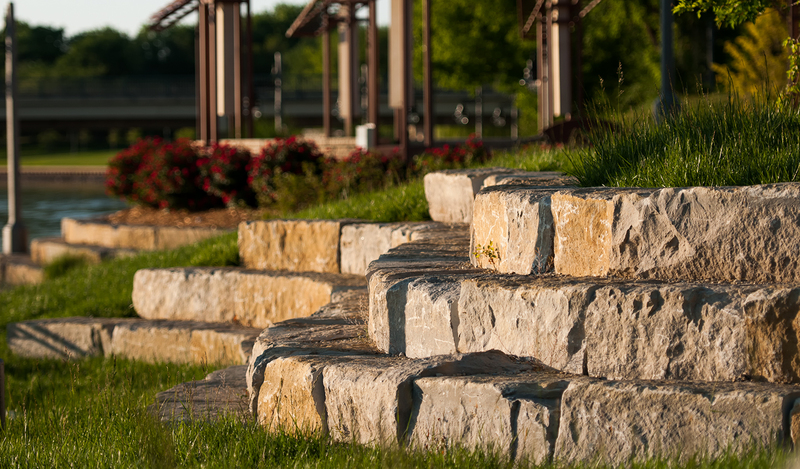 Walkways weave throughout the landscape creating intimate pause points while larger areas of turf and ledgerock accomodate larger crowds during event times. A small performance space was created for use by the general public and for hotel events such as weddings. 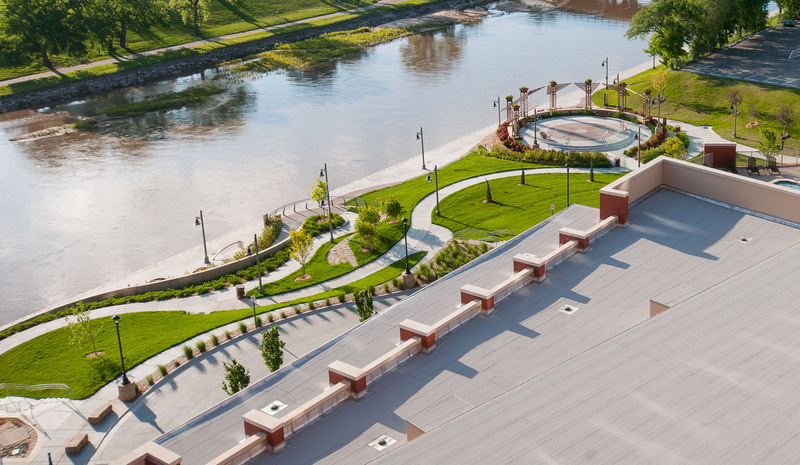 The space is punctuated by custom shade columns which give added enclosure to the space as well as making it a focal point along the banks of the Arkansas River. 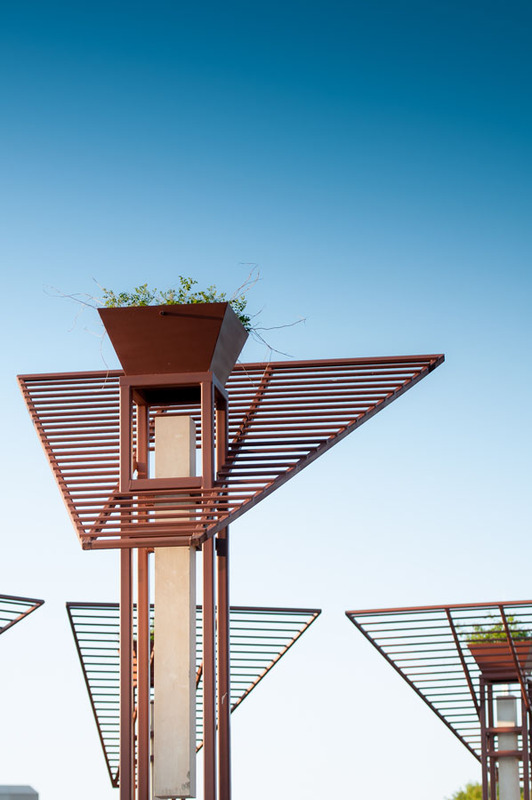 The shade columns were designed and fabricated by a local artist and have integrated planters at the top to facilitate vines which will cover the trellis and create a respite for users of the promanade pathway. 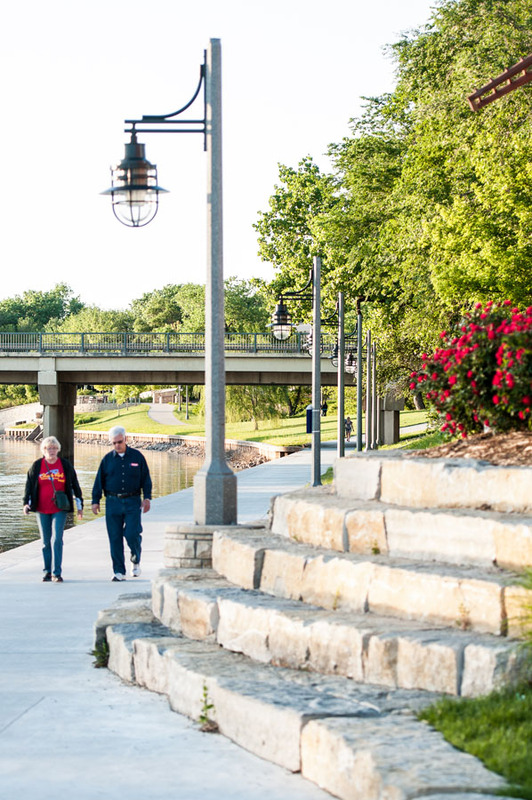 The 880 linear feet of bulkhead edge with custom treatments was installed along the riverbank and varies in width from 10 to 20 feet. 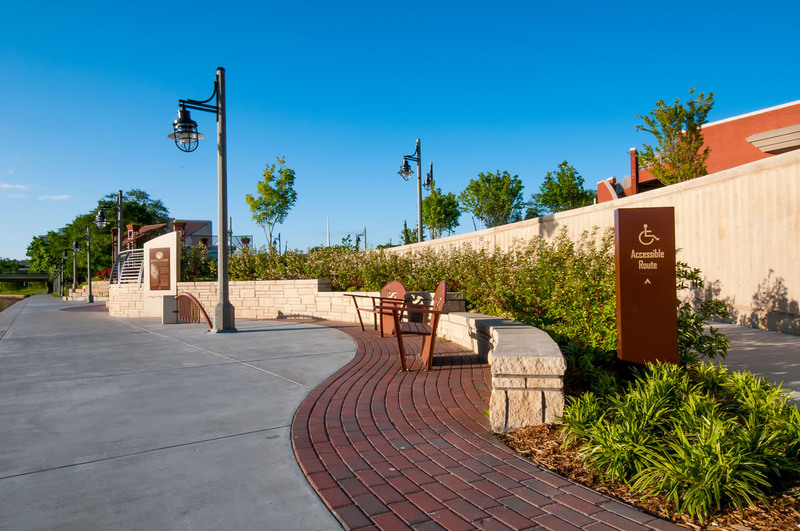 It also features new lighting and specialty paving along with tactile edge design treatments. The terraced walls necessary to accomodate the 12 feet of grade change vary in height and material. The major site wall is constructed of colored concrete, curves in both plan and elevation and features a sine-wave form liner finish; all of which respond to the overall design theme. 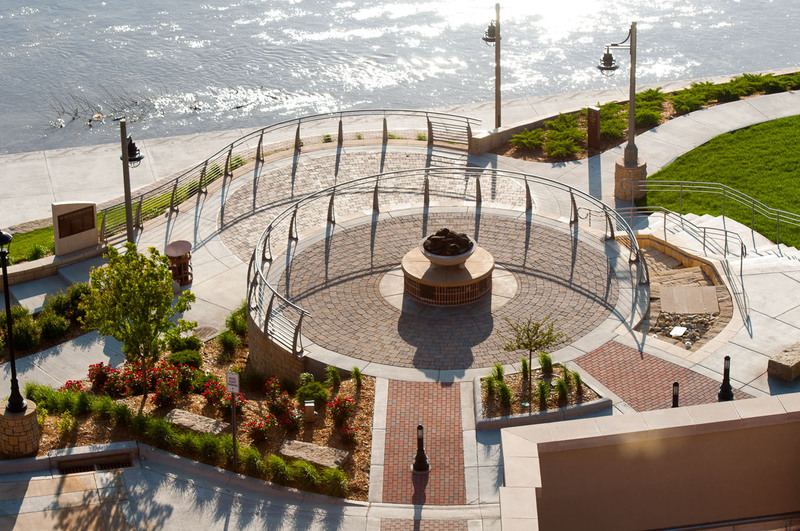 A fire bowl and small cascading water feature were designed with an overlook to invite hotel guests to engage with the river bank and help activate and integrate both the public and private areas. Weaving walkways snake through the landscape like runnels, reflective of the prairie river. These walkways gently move users through the space and allow access to Douglas Avenue. 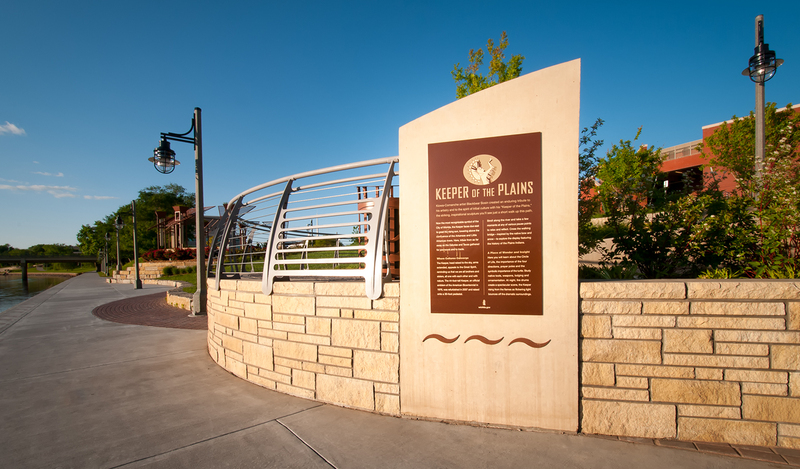 Custom wayfinding and interpretive signage along with furnishings populate the space and continue thoughout each phase of the overall Arkansas River Corridor Project. 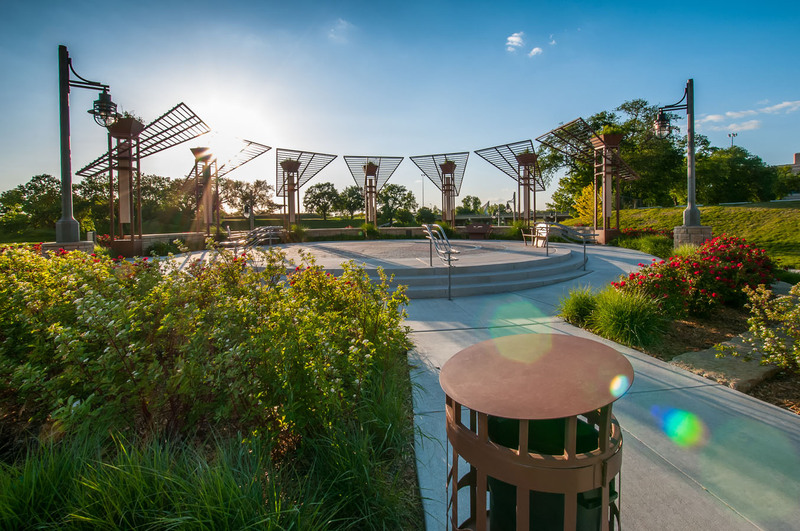 Resolving logistical issues between the two owners, properties and contractors proved to be a challenge, but were resolved due to the common goal of creating an attractive and functional space along the city’s greatest natural resource.